Panawave vehicle There are 183,000 officially registered religions in Japan---and perhaps thousands more unregister ones. The vast majority of these are “new religions” or cults, with about 2,000 of them having sizable following. By some estimates 10 to 20 percent of Japanese population has some connection with one of these groups. Many of the cults are linked with Buddhism and to a lesser extent Shintoism. Some feature charismatic leaders, ecstatic behavior, end of the world doctrines and beliefs in magic. Registered religions and religious corporations are granted tax-free status and are examined by the government when they apply for official status but after that are rarely checked again. In 2008, 13,4000 religious corporation did not submit the reports that they are legally required to submit, double the number from five years earlier. Groups like Tenrikyo and Konkokyo emerged in the 19th century and have roots in the 17th century. Tenrikyo means religion of Divine Wisdom. Regarded as a Shinto sect with many Buddhist elements, it was founded in 1839 by one Miki Nakayama who claimed to have received a revelation that mankind was created by kamis and their bodies are on loan from them with only the heart and mind having free will. One "new religion" that emerged after the Meiji Restoration in 1868 revolved around a new dance with a magic formula called ee ia naika (“it's good isn't it?”). The appearance of a large number of new religions after World War II has been attributed to a spiritual vacuum created by the end of emperor worship and the creation of legal system that granted tax-free status to registered religious movements. Many new religion and gurus sprung up during the boom years in the 1970s and 80s, when it was said many Japanese became alienated with materialist society. While attendance at traditional places of worship has declined in recent years, the number of new members to non-traditional religions has increased. Before the subway sarin gas attack by the cult Aum Shinrokyo that left 12 people dead new religions were regarded by most ordinary Japanese as harmless. But these days many Japanese regard them as “scary” or at least “dubious.” After the subway gas attack, the Japanese government decided to put religious groups under stricter control and strengthened regulations concerning financial statements and other disclosures to the government. Book: From Salvation to Spirituality: Popular Religious Movements in Modern Japan by Susumu Shimazono (Trans Pacific Press, 2004). Many of the new members to religious sects are between 25 and 40. Explaining the attraction of cults, one Buddhist monk told the Boston Globe, young people "feel very empty and lonely in their hearts. That is one reason some people go into cults...Not having any other place, some go to organizations like Aum." Many of those attracted to religious cults are described by Japanese as otaku (anti-social nerds) and majime (people searching for meaning but incapable of seeing it). A former member of Soka Gakkai, one of Japan's largest sects, told Time, "As Japan entered an era of high economic growth, people moved from rural areas to industrial centers. They were lonely, poor and cut off. Soka Gakkai offered companionship, easy loans and an ideology to fill the gap." One of the largest religious sects in Japan is the Soka Gakkai (Value-creating Society) school of Buddhism. Between 1951 and 1980 it grew from 51,000 to 16 million members. It now has around 8 million members. Tina Turner is one of the 300,000 Soka Gakkai members in the United States. Soka Gakkai, also known as Hito no Michi, is a form of Mahayana Buddhism and has links to the Nicherien sect of Buddhism. It followers believe that salvation and good luck can be attained by repeatedly chanting, "I take my refuge in the Lotus Sutra." The Lotus Sutra is an ancient Mahayana Buddhist text. It asserts that all beings can attain the state of Buddha and enlightenment through simple devotion. Soka Gakkai was founded un 1930 as a branch of Nicherien Shoshi, one of 38 Japan Nichiren Buddhist sects, by Tsunesaburo Makiguchi, a follower of Nichirien Buddhism who was jailed for his beliefs and died in prison in 1943. After World War II, the religion was headed by Josei Toda, who believed that political power was the best want to protect Soka Gakkai from persecution. Two years after Toda's death in 1958, the religion was taken over by Daisaku Ikeda. The mastermind behind the groups's financial and political activities, Ikeda is regarded as a monarch by his followers, who routinely burst into tears of happiness when they listen to him speak at rallies. While followers have called him a "wonderful and brilliant" master, former close associates say that he is temperamental, power hungry and not very religious. Many Soka Gakkai members send their children to Soka Gakkai schools and devote much of their time to rasing money, winning converts, canvassing and performing political chores such as calling neighbors to get out the vote before elections. Members are encouraged to turn over a large percentage of their income to their Soka Gakkai and taught that giving money to the sect will earn them merit in their next life. Soka Gakkai is organized like a cooperation and it is believed to control assets worth $100 billion. Activities that fall under a broad definition of religion are not taxed and its extensive business holding are taxed at a much lower ate that businesses held by non-religions. Annual fund raising drives pull in around $2 billion. Ex-members are reportedly followed, harassed and intimidated. One former member received death threats and his wife was called by the Soka Gakkai Housewives Association and encouraged to divorce him. Another former member, who set up of a competing temple, had 300 Soka Gakkai members burst into his temple during a religious service. Some of them grabbed him and beat him until he passed out. "I thought I was going to die," he told Time. He spent three months in the hospital recovering from injuries to his lungs and other internal organs. Soka Gakkai founded Komeito (Clean Government Party), a political organization that has been a major force in Japanese politics for three decades. Founded in 1964, it was the third largest party in Japan in 1980, with 49 members. In 1995, it had 52 seats in the 511-member lower house of the Diet. (The lower house wields more power than the rubber-stamp upper house). In 1995, Komeito merged with Shinshinto (New Frontier Party), the main opposition party. In a July 1995 election, Soka Gakkai accounted for half of Shinshinto's 12.5 million votes. Before the alliance with Shinshinto, Soka Gakkai maintained links with a corrupt faction in the ruling Liberal Democratic Party (LPD). Komeito is a well organized political machine supported by a massive army of volunteer canvassers. It legislators claim they are not followers of Soka Gakkai (Komeito and Soka Gakkai formally broke formal ties in 1970) but nearly all them were practitioners of the religion before they were elected. Soka Gakkai isn't the only religion involved in politics. Other Buddhist sects have political wings and legislators who support their causes in return for financial support. The Aum Shinrikyo doomsday cult reportedly decided to launch the sarin gas subway attack after it failed to do well in local elections. In 1970, Komeito and Soka Gakkai formally separated after Komeito leaders were involved in a scandal in which bookstores were pressured not to sell a book critical of Soka Gakkai. In the late 1980s, Soka Gakkai was allegedly involved in a multi-million art purchase scam that set up slush funds for political candidates they supported. In 1992, Soka Gakkai helped the LPD pass a controversial law allowing Japanese troops abroad in return for government help in ending "tax cases against the sect." In September 1995, a 50-year-old local assemblywoman fell to her death under suspicious circumstances from the 5th floor of the Tokyo office building where she worked. At the time of her death she had been investigating Komeito corruption and was trying to help harassed ex-Soka Gakkai members. Before her death, she had received a number of death threats. Police concluded that her death was a suicide. Family insisted "she was not the type to commit suicide." Yamaguchi experimental communities have existed in Japan since 1953. Founded by Yamagishi Miyozo, the communities aim to create a utopian society by following a philosophy and set of principals that reject consumerism and materialism and advocates simple, communal living, the eating of simple, organic foods, and working when one feels like it rather than when one has to. The group is famous for selling organic food and is also known for its progressive ideas about childcare and education. The are around 7,500 people (5,000 adults and 2,500 children) living in Yamaguchi communities. Members live in small rooms with virtually no possessions. Most labor in economic activity related to the raising and selling of organic food. Efforts are made to break the bonds between parents and children. After the age of five children live together in a large group, overseen in a loose, hands-off way by a group of adults. Learning is lead by children seeking help with assistance from adults. Yamaguchi is not really a religion. Rather it aims to "change ways of thought with reliance on God or Buddha” and “to do so scientifically, utilizing the capabilities of the human mind alone." The group has been accused of behaving like a cult: requiring members to fork over their money to the group and hiring guards to keep grandparents from seeing their grandchildren. The Perfect Liberty Association (PL) is a cult that preaches a "life is art" creed and believes problems can be solved by mass pilgrimages. It puts on one the best fireworks shows in Osaka, owns a high school with one of Japan's best school baseball teams, and accrued massive debts after bubble economy collapsed. PL was founded in 1924 by a Buddhist priest named Miki Tokuharu who was "cured" of chronic disease by spiritualist Kanada Tokumitsu. After recovering Miki turned away from Buddhism and began following Kanada. In its first decade PL attracted about a million members. The religion was persecuted during the World War II period, Miki and many members were imprisoned. Miki died in prison. After the war the PL carried on under the leadership of Miki's son, Miki Tokuchika. The PL headquarters at Tondabayashi (near Osaka) contains a hospital, schools, a youth center, a golf course, baseball diamonds, a temple, a museum and a bizarre-looking 550-foot-tall tower. The group’s leader lives comfortably but is required to offer personal counsel to any member that has a problem. PL beliefs are based on Shinto and Buddhism. Followers believe that every action in life is a form of self-expression and thus things like playing golf and baseball and producing art and poetry are regarded as forms of religion. This belief is summed in the slogan: "When work becomes worship, religion is truly lived. When art is expressed in all life, God is truly recognized." "Liberty" in the religion's name refers to liberty from hostility and suffering. Hardships are regarded as warnings from God and illnesses are cured through spirituality after patients complete a computerized questionnaire.Golf is also a central part of PL. Fenced-in cult compounds have golf courses and encourage members to play. Some PL "churches” have driving ranges on their roofs. Members are taught to eschew their ego, pursue individuality by following 21 principals that includes things like "no complaining about food," "getting up pleasantly in the morning," "living in harmony with your spouse," "not even thinking about cheating or being unfair" and "not being boisterous." Upon joining, new converts are required to buy the Believer's Handbook, a badge and a six month subscription to the PL magazine. Members are also encouraged to put daily "love offerings" in "treasure bags" that are turned over in monthly "thanksgiving" services at the church. Each member is regarded as a missionary. Cells of members are expected to attract 80 new converts a year. The names of converts are inscribed on the walls of the churches that host daily 5:00am services in which members are encouraged and be active and artistic. The Panawave Laboratory is religious cult that made headlines in May 2002 when members dressed in white clothes and took to the road in 15 white vans and stopped along highways and country roads and covered trees, guardrails and signs with huge white sheets. 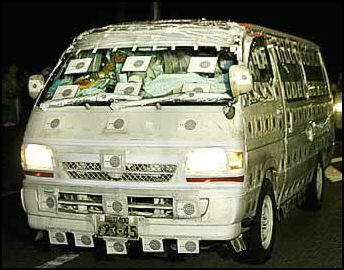 The windshields and windows of their vehicles were covered with white sheets and weird black and white stickers that made it near impossible to see in and out of the vehicles. The white sheets, white clothing and the weird stickers were intended to protect their members from dangerous electromagnetic waves. The Panawave Laboratory has around 1,200 members who live in white geodesic domes in the mountains of western Fukui Prefecture. They only eat Instant noodles and don’t believe in bathing. The group was led by a woman named Yuko Chino who was suffering from cancer during the road trip and traveled in van full of cats. Their road trip through central Japan was part of an effort by the group, it believed, to keep the world from ending due to cataclysmic earthquakes caused by the reversal of the earth’s magnetic poles. A spokesman for the group said the world would be saved if Tama-chan---a bearded seal that was in the news in Japan at that time---was rescued and placed in a swimming pool the group had specially built for her. The road trip by the Panawave Laboratory drew a lot of media attention. In places where the group set up camp they were told by police to move along and remove white the covering and stickers from their windshields and windows of face arrest. At one point cult members became so freaked by the army of reporters following them they donned white shields, sabotaged a radio tower and summoned a white bulldozer to get rid of the reporters and paparazzi following them. In the end the cult returned quietly to their community and the media stopped covering them. In December 2003, five members of the cult were arrested on suspicion of beating a university assistant professor who was later declared dead at a hospital. The beatings were done with a bamboo sword and a stick made or corrugated cardboard at the Panawave headquarters. The cult claimed the blows were intended to increase the victims mental powers not to injure him. Ho-no-Hana Sampogyo is a cult whose leader, Hogen Fukunaga, was jailed on charges of fraud in connection with swindling five people out of $250,000 for "sole-of-the-foot" diagnosis. It is believed that he swindled people out of $500 million. Fukunaga founded the cult in 1980 after a company he owned that produced electric foot massages went bankrupt and he heard a "vox die" ("voice of God"). The central act of the Ho-no-Hana cult is the "sole-of-the-foot" diagnoses in which a person’s health and fortunes are ascertained based on the condition of the soles of their feet and the length of their toes. Many people who underwent the procedure were told that their soles were dirty and there was a good chance they would develop a serious disease. They were then told they needed to pay large sums of money for training sessions and items sold by the cult that would make them better. More than 30,000 people are thought to have undergone "sole-of-the-foot" ritual and participated in Ho-no-Hana training sessions, in which members were required to recite sutras and read Ho-no-Hana behavior and house management guides. Participants in the five-day training sessions were allowed to sleep only 10 hours total and eat five meals during the entire five days. On the final day, when their defenses were at their lowest, participants attended "judgments" in which they were verbally abused and then praised and encouraged to continue their treatments. One man told the Yomiuri Simbun that is son wanted to take a Ho-no-Hana training session after he was diagnosed with colon cancer. The man underwent a "sole-of-the-foot" diagnose and was told he was "trampling on his son" and that participation in a five-day train session would make everything okay. The man paid about $50,000 for training sessions of himself, his wife and his son, who was taken out of a hospital against his doctor's orders, and was told there that his son would be saved if the man bought $100,000 worth of hanging scrolls and other items sold by the cult. After the sessions the son's conditioned worsened and he died two months later. In November 1999, the Life-Space Cult made headlines in Japan when a dead body of a 66-year-old man was found in a room used by the cult in a hotel near Narita airport. An autopsy reveled that man had been dead for three weeks to four months. But leaders of cult denied this. They insisted the body was alive until it was killed by police during an autopsy. Members of the cult asserted that body was receiving treatments called "shakty pats”--- series of head massages and repeated body taps performed by the cult long haired and one-eyed leader, Koji Takahashi. The victim had suffered a cerebral hemorrhage in June 1999 and was placed in a hospital. Takahashi ordered the victim's family to take him out of the hospital, against doctors orders and bring him to the hotel. Takahashi was arrested. In February 2002, he was sentenced to 15 years in prison for the murder of the 66-year-old man. A similar case involving the Kaedajuku Cult occurred around the same time. Two mummified bodies (of a 6-year-old boy and an infant) were found in the cult's headquarters in Miyazaki. Leaders of the cut said they were "channeling resurrection energy" into the children to bring them back to life. The Kaedajuku Cult incorporats elements of Christianity, Taoism and Shintoism. The leader calls himself "the creator's proxy." Members wear yellow uniforms and use wooden boxes as "wave creators" and windmills to send spirits. In a similar case a dead 20-month-old baby boy was kept for more than a month by his mother. The head, abdomen and chest of the boy were cut open with scissors because a "shaman" who worked at a health food store told the mother that "although the exterior shell of the body has died, the interior is still alive." Mt. Asama Kigen-kai (Era-Socity”) is a Shinto-linked group based in Komoro, Nagano prefecture. Headquartered in an opulent facility situated on a hill, it is based in Shintoism and was founded in 1970 by Kensuke Matsui, a man who wore tattered military fatigues and claimed he was the reincarnation of a famous prince from the ancient Yamato clan. Today the cult is run by Yasuko Kubota, the 50-something daughter of the founder. Believers call Matsui the “Great Diety” and regard him as a great exorcist and healer. His daughter is called the “second messiah” and like her father has lots of money and drives around in a Rolls Royce. Members can only enter the group’s headquarters after making a series of bows and secret handshakes towards a pair of stone statues. They purchase special water, which they believe can cure every known ailment, for $600 a liter, and are punished if they seek help from real doctors. Rituals included dumping huge amounts of fish and fruit into a local river and digging holes in Mt. 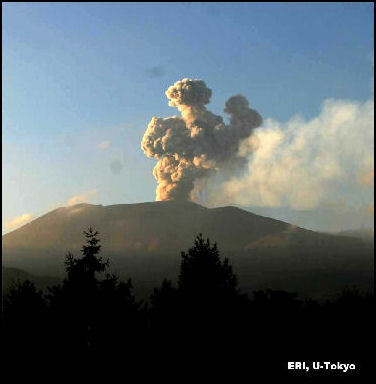 Asama, a neraby volcano, to make votive offerings of fried tofu to the fox god. Bad feelings grew within the group when it became clear the miraculous waters did not heal everyone and the Matsui himself died of pancreatic cancer in 2002. In October 2007, police raided three Kigen-kai facilities and arrested 21 people after a 63-year-old female member was beaten and trampled to death by other cult members---most of them women---after she was criticized for have a “bad attitude” because her daughter jokingly presented a condom to the “Great Deity’s” granddaughter and told her it was an amulet that would protect her and bring her great fortune. The victim, Motoko Okuno, was the owner of a Kyoto-style sushi shop where cult members often me,. She had belong the sect for some time. Her daughter was punished first. She was covered in a trash-bag covered with condoms and beaten. Okuno’s beating lasted more than hour and was carried about 50 woman following orders of the cult’s leader. During the beating she was knocked to the ground with a blow to the back and beaten, kicked and trampled while writhing n the floor. Her face was caked in chalk and a fake gun was shoved into her mouth. Special orders were given to stamp on her thighs to inflict maximum pain. Many think that Okuna was singled out because she was close to the founding guru and criticized his daughter for twisting his teachings. The 21 were arrested on charges of causing injury leading to death. Among them were 15 women, including Kubita herself. The oldest was 81 and the youngest was 15. Happy Science has members in about 80 countries. The group has a worldwide network of two shoja temples and 61 branch temples, branches and local units as of June 2010. In Japan there are regular “international retreats,” which centers around Happy Science teachings and aims to bring members closer together. The group is also involved in a number of foreign aid and charity activities. Byakko Shinkokai is a pacifist organization that runs around putting up signs in English and Japanese that read "May Peace Prevail on Earth." Another is led by a man who claims he possesses superhuman powers that allow him to live without food or sleep. Others worship people’s feet and ring bells. Kanshinji a religion based in Hakusan, Ishikawa Prefecture. Members are expected to spend $10,000 for 30-centimeter-high glass “objects of worship” that are said to contain DNA of the founder of the religion. The manufacturing cost for each object is around $450. Tax officials have slapped the group with a tax fine of $5 million. Shinnyeon was founded by a priest of the Shingon sect of Buddhism in 1936 and claims to have 796,000 members today. Members admire Sakyamuni, the historical founder of Buddhism, and believe anyone can become a Buddha. A typical member visits the cult headquarters once a month, donates about $200 a year to the cult and follows the cult’s principals of acting kindly towards others. Uchu Shinri Gakkai (Cosmic Truth Society) is a religious group founded in 1983 that remained largely dormant until 1994. It earns much of its revenues from 23 love hotels its runs and was charged with hiding ¥1.4 billion in revenues by tax authorities in 2009. Japan has hundreds of thousands of followers in Rev. Sun Myung Moon's Unification church. About 21,000 people in Japan were involved in a satellite-linked Unification Church mass wedding in the 1990s involving 363,000 couples. In 1995, police found the decomposing bodies of two men and four women stuffed into futons in the house of a 47-year-old faith healer named Sachiko Eto. The victims were followers of Eto who died during an exorcism intended to rid the victims of evil spirits, in which the participants beat each other with drum sticks and were beaten by Eto and two others. One other person who endured the beatings was seriously injured but survived. Eto claimed to be god’s messengers and condemned the followers tod death and was able to carry out the death because of her absolute power over them The police investigated the house after a woman reported she was beaten there and she disappeared. Neighbors said that Eto appeared to be an ordinary housewife even though sometimes strange drumming noises, screams and odors emanated from her house. In May 2002, Eto was sentenced to death for murder for killing four of the people and inflicting injuries that caused the death of two others. The court rejected her insanity plea. Three of Eto’s followers were given prison sentences for their role in the crime. In 2008 the Japanese Supreme Court upheld the death sentence. According to the police, the two had performed the practice on the girl more than 100 times since March 2011. The ritual was performed under a 3.5 square-meter concrete "waterfall" at a church of a religious group Nakayama-shingo-shoshu in Nagasumachi. The running water is pumped up from groundwater to a height of 2.5 meters. In late August the men strapped Tomomi to a chair and placed her faceup under the falling water for about five minutes.Tomomi fell unconscious, after which the men called an ambulance, but she died at 3:40 a.m. on Aug. 28 at a hospital from suffocation. Tomomi's father reportedly told the police: "My daughter was possessed. So we performed the ritual on her to exorcise the demons so she could get well. "But she resisted and became violent, so we tied her to a chair." The two men denied the charges, saying it was "not an assault." During the ritual, Maishigi held down his daughter while Kinoshita recited sutras, according to the police. Tomomi reportedly had suffered from mental and physical illness since she was a senior-grade primary school student. Maishigi was introduced to the religious group through an acquaintance and started visiting the church with Tomomi in March. Kinoshita urged Maishigi to perform the ritual on Tomomi. According to the police, her parents even "practiced" it on her sometimes, according to the police. The Kumamoto municipal school board said Tomomi had not attended school since April. According to the Cultural Affairs Agency, Nakayama-shingo-shoshu was recognized as a religious corporation in 1952. It had about 350 temples and churches nationwide with 305,555 believers as of the end of December 2008. Members of the Unification Church were arrested in 2009 on extortion charges for allegedly selling expensive personal seals to people by telling them they would suffer bad fortune if they didn’t buy them.